The JCM 417 Carbon Steel Weld-on Tapping Sleeve comes in the full wrap style. 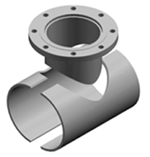 This split weld on sleeve is designed to reinforce the steel pipe to be hot tapped. 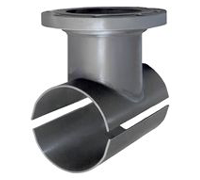 The model is designed for steel pipe with wall thickness of 1/4" and greater. The 417 comes standard without a test plug. Optional: test plug, add $25.00 to price. Larger Sizes and Designs available upon request. Optional Material: 304 / 316 Stainless Steel available upon request. 1. Determine pipe O.D. and outlet size. Each sleeve is fabricated to the exact O.D. of the pipe.